Oue eye care experts in Jupiter, FL use cutting-edge digital imaging technology to assess your eyes. Many eye diseases, if detected at an early stage, can be treated successfully without total loss of vision. Your retinal Images will be stored electronically. This gives the eye doctor a permanent record of the condition and state of your retina. 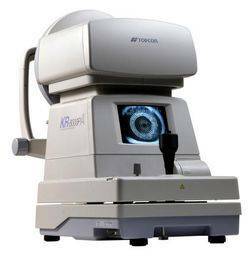 This is very important in assisting your Jupiter optometrist to detect and measure any changes to your retina each time you get your eyes examined, as many eye conditions, such as glaucoma, diabetic retinopathy and macular degeneration are diagnosed by detecting changes over time. Each eye is tested separately and the entire test takes 15-45 minutes. Dr. Kelso may ask only for a driving licence visual field test, which takes 5-10 minutes. If you have just asked for a driving test or the clinic doctor advised you have one, you will be informed of the result by the clinic doctor, in writing, in a few weeks. We know that Macular Degeneration is directly related to antioxidant levels in your body. We have the first measuring device in the world to give you a Skin Carotinoid Score. This 90 second test was designed to scan the retina for carotinoid levels gives us immediate evidence of carotinoid antioxidant activity in your body. We believe and ounce of prevention is worth a pound of cure. Tired of going through the classic line of questioning at the eye doctor: "Which lens is better? This one, or this one?" Never quite sure you chose the right one? What if we told you that you'll never have to go through that endless interrogation again? Welcome to the next generation eye exam, with auto-refractor technology!